After which we went to the Big Lagoon. This time we were not allowed to get off the boat. We just glared at the beauty of the big limestone cliffs surrounding the lagoon. Too bad the batteries of the cameras we brought were empty we were not able to take some more pictures of the last 2 lagoons. Sigh. The tour guides allowed us to snorkel at the coral reefs outside the Big Lagoon. We saw some more fishes and coral reefs. Last but not the least was our stop at the Small Lagoon. Here we had to swim and enjoy the last of the tour. There was a small cave at the very inside of the lagoon. It was a bit scary but still a good thing to experience. As our boat was heading back to the town proper, I keep reminiscing the beauty of the tour that I just experienced. 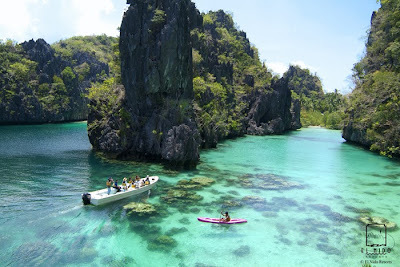 Even though exhausted, I am still looking forward to see some more of El Nido.